Mimecast for Salesforce.com is a free application that lets CRM users instantly access archived data, with granular search filters, and a time-saving Search Widget, all without leaving the Salesforce console. By integrating Mimecast Cloud Archive access and functionality with Salesforce.com, the app can help organizations drive maximum CRM efficiency and productivity. To serve a diverse range of CRM use cases and user preferences, Mimecast for Salesforce supports simple keyword-based searches, contact-based searches, and account-based searches. The app also lets users filter search results by subject, date, time, and the presence of attachments. These search and filtering tools simplify the task of pinpointing specific messages or attachments irrespective of archive size. Users can easily access attachments relevant to the contact or to the account through a file download dialogue. Users also have the option to add Search Widgets to their Salesforce.com console. Mimecast for Salesforce.com offers two Search Widgets. A Contact Search Widget automatically display all messages between the user and the contact displayed in the CRM record. An Account Search Widget displays all messages between the user and all contacts with email addresses in account’s web domain, extremely useful if a complete account perspective is required. 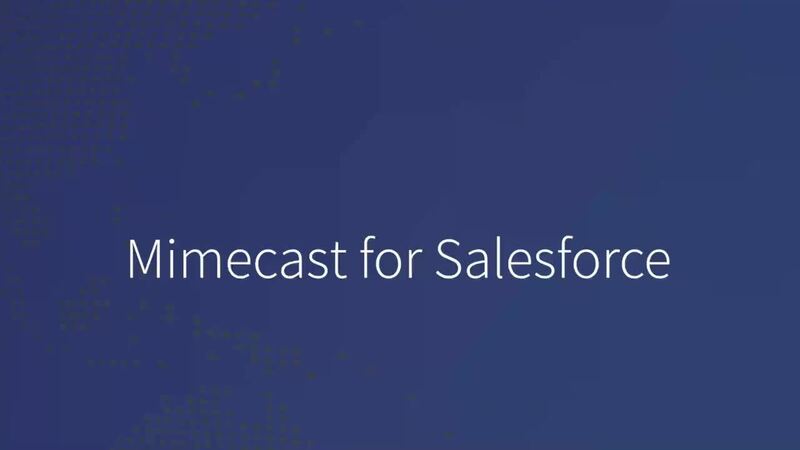 Mimecast for Salesforce.com is a free application that lets CRM users instantly access archived data, with granular search filters, and a time-saving Search Widget, all without leaving the Salesforce console. The Mimecast integration with IBM QRadar offers joint customers improved visibility into potential vulnerabilities, ongoing attacks, prioritized incident response alerts and an overall increased security posture through one single console. The Mimecast for Splunk Enterprise app helps you identify threats more quickly and respond faster. It does this by providing an easy way to add Mimecast gateway and audit events into your Splunk Enterprise environment. LogRhythm and Mimecast have developed an integration that combines email security with enterprise security and threat management.